Rumpole, I may dig this one out and make a folder if it ever goes to trial. This craziness with kids wanting to kill (and burn a cop) is getting close to home. 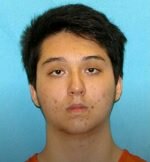 A Plano teenager was arrested for planning and trying to recruit others to commit an ISIS-inspired mass shooting at a Texas shopping mall, Stonebriar. According to authorities, Plano West High School student Matin Azizi-Yarand, 17, planned the attack for mid-May after being inspired by ISIS. At the time of his arrest, Azizi-Yarand sent more than $1,400 to others for the purchase of weapons and tactical gear. Through several conversations online, it was uncovered that Azizi-Yarand wanted to act as a lone wolf. He wanted to wait until he was 18 to carry out this attack so he could purchase a rifle himself, according to affidavits. "I've only been reading ISIS magazine guides for performing operations and making bombs," Azizi-Yarand told the undercover federal agent. Affidavits show throughout several other online conversations, Azizi-Yarand sent the agent various types of ISIS propaganda. "I'd like to actually make a cop surrender and drop his gun, then douse him with gasoline and burn him ... record it," Azizi-Yarand said during talks about the mall shooting. Authorities say he had written and planned to release what he called a “Message to America,” which explained the reasons for his attack. A U.S. official says a deadly explosion at a Southern California office building is being investigated as an intentional act and investigators believe the blast may have come from a package. One woman was killed and three others were injured during the Tuesday afternoon explosion at a medical office building in Aliso Viejo. The official said the information was based on a preliminary investigation. Investigators said they hadn’t yet located an explosive device and were searching through debris. The official was briefed on the investigation but wasn’t authorized to discuss the matter publicly and spoke to The Associated Press on condition of anonymity. Agents from the FBI and the Bureau of Alcohol, Tobacco, Firearms and Explosives were at the scene Tuesday night. Sheriff’s officials said the size of blast made it suspicious. Baltimore County police said a 16-year-old has been arrested and charged as an adult in the death of a police officer on Monday, and three other suspects — all teenage males — are in custody. Court records show the 16-year-old is Dawnta Anthony Harris, of the 1600 block of Vincent Court, in the Gilmor Homes complex in West Baltimore. He is charged with first-degree murder and is expected to appear in Towson district court for a bail review hearing Tuesday afternoon. He did not have an attorney listed in online court records, and family members could not be immediately reached for comment. The department identified the officer who was killed as Amy Caprio, a four-year veteran of the force assigned to the Parkville precinct. The documents say Caprio was responding to a call at about 2 p.m. Monday on Linwen Way to investigate a suspicious vehicle in the area. A 911 caller reported a black Jeep Wrangler near her home, and said three “suspicious subjects got out of it and were walking around homes.” The caller then said the suspects had broken into the home and the first arriving officer was on the ground after confronting the driver of the Jeep. The search for the remaining suspects, whom police considered armed and dangerous, extended into the evening and left nearly 2,000 students stranded in their schools until parents were allowed to pick them up at about 7:30 p.m.
Police would not confirm whether the Jeep had been stolen, but they believe it was also involved in an earlier burglary. Detectives have verified that the group were involved in burglaries in the area, police said. Officers were reporting to the area Tuesday to canvass for property stolen during the burglaries. Tony Kurek, 54, had just walked in the door of his home when his son, Dakota, shouted for him. “ ‘Dad, Dad, a cop just got run over out front,’ ” the father recalled his son saying. The officer was lying in the road in front of his house, he said. Dakota told his father he had seen the officer draw her gun on a black Jeep Wrangler and ordered the people inside to get out. Instead, the driver sped forward, ramming the officer with the vehicle. She landed about 20 feet away. “She basically landed almost in front of my mailbox,” Kurek said. I wonder if there is more to this incident? A Portland police source said the registered owner of the SUV is flagged in the bureau's database as suicidal with mental health issues. Police also believe the crash was intentional based on witness statements. A student armed with two handguns shot a teacher and a fellow student at a middle school in Indiana on Friday, police said, the latest in a series of shootings at U.S. schools and colleges fueling debate about how to keep campuses safe. The teacher who was shot swatted the guns away from the student and wrestled him to the ground, protecting other students in his science class, witnesses told local media. The suspect had excused himself from class at Noblesville West Middle School and came back armed with the pistols and opened fire. Police apprehended him in the classroom. Local media said the Noblesville student who was shot was a 13-year-old girl. The teacher was identified as Jason Seaman by the Indianapolis Star and other local media. Seaman’s mother said on Facebook her son was shot through the abdomen, in the hip and in the forearm, and was undergoing surgery. Paulding County, GA — On Friday, at 9:51 AM School Resource Officers with the Paulding County Sheriff’s Office arrested a Hiram High School senior for possession of a weapon on school grounds. Paulding County Sheriff’s Office School Resource Officers monitor social media outlets looking for nefarious activity among students. This morning, a School Resource Officers observed a photo that had been posted on Brian Perry Belin, Jr.’s Instagram page where he had what appeared to be a semi-automatic pistol in his waistband. Belin, Jr., who was scheduled to graduate from Hiram High School tomorrow morning, was removed from graduation practice this morning and asked about the photograph and the gun by School Resource Officers and administrators. 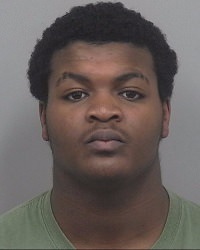 Belin, Jr. told administrators that the gun was inside his vehicle which was parked on campus. When administrators searched Belin, Jr.’s vehicle, they located a loaded semi-automatic pistol that matched the one that was pictured in the Instagram post. 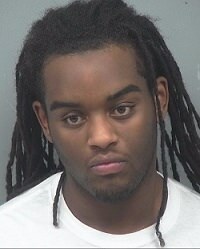 Belin, Jr. was subsequently arrested and charged with possession of a gun on school grounds. A series of notes found with explosive devices led to the arrest of a Beaumont man accused of placing the devices, one of which exploded at a southeast Texas church. Authorities announced the arrest of 40-year-old Jonathan Matthew Torres in connection to several devices found around the city since April. Federal investigators found postcards next to the devices that contained notes from the alleged bomb maker. A device left outside a Beaumont Starbucks had a note on an index card stating "HAJI DIE USA -JH"
The day after the Starbucks device was discovered, police said they received a note that read "DO YOU WANT BMT (Beaumont) TO BECOME ANOTHER AUSTIN" referencing the series of explosions in Austin that killed two people. Earlier this month, a device exploded at the St. Stephen's Episcopal Church in Beaumont. Investigators said the remnants were similar to the device that was not exploded at the Starbucks in April. The day following the church blast, police said they received a postcard appearing to be from the same sender as the previous note. The postcard had an image of "V for Vendetta" from DC Comics and writing said, "WOULD YOU LIKE TO PLAY A GAME? JH." The police department would receive two more postcards over the next week, one with an image from the "Creature from the Black Lagoon" and the other from "The Atom." The postcards asked police, "There were two others. Did you not get them?" and "None of these have been deemed a credible threat." 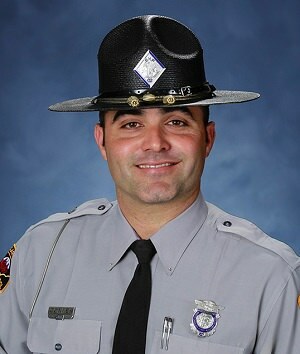 Basically Dixon made a general claim that the trooper made inappropriate physical contact with her, to a detention officer and in a telephone conversation. By Texas law, she had to make a claim to a peace officer in order to bring charges against her. In addition, there is another DPS Trooper with the same name in a different area of Texas, who has received death threats this week. A DPS Trooper is the top of the line as far as Law Enforcement in Texas. I hope this Trooper sues the pants off Shaun King. WAXAHACHIE, Texas (CBSDFW.COM) – The Ellis County District Attorney’s Office announced Friday evening, Sherita Dixon-Cole will not be charged beyond her DWI arrest after she said she was sexually assaulted by a DPS trooper, when she was not. Here is a statement from Ellis County DA Patrick Wilson’s Office. This office shares the outrage felt by the general public for the blatantly false and malicious allegations made by Sherita Dixon-Cole against the Texas Highway Patrol trooper who arrested her for driving while intoxicated on Sunday, May 20, 2018. However, no criminal charges will be filed against Dixon-Cole for her conduct. We know this decision will frustrate many in the public who have called for criminal charges against Ms. Dixon-Cole as both a punishment to her and as a deterrent to others who may make false and damaging allegations against the peace officers who protect all of us. We share the public’s frustration. In making any decision to charge a crime, this office is bound by the facts and the law. To help the public understand our decision in this matter, we are providing a detailed analysis of the facts and law. Dixon-Cole was arrested for DWI and then retained the services of Dallas Civil Rights Attorney Lee Merritt. Merritt hastily called a news conference and then cancelled it while local media waited for him to explain the claims. Video released by DPS showed the trooper behaving in a courteous and professional manner after Dixon-Cole’s claim gained national attention. He went on to repeat claims that the trooper offered to release Dixon-Cole in exchange for sexual favors and then sexually assaulted her when she refused. He also accused the trooper, apparently based on Dixon-Cole’s account, of threatening to kill her fiancee who arrived on the scene if she told him about what happened. Except that it didn’t happen– and the body camera footage shows that her account was completely fabricated. Baker was answering a "suspicious vehicle" call. He was shot three times in his patrol car. He wasn't found until much later when he didn't respond to a check call on his radio. DICKSON — A statewide manhunt is in effect for an armed and dangerous suspect who authorities say shot and killed a Dickson County Sheriff's Office sergeant Wednesday morning. 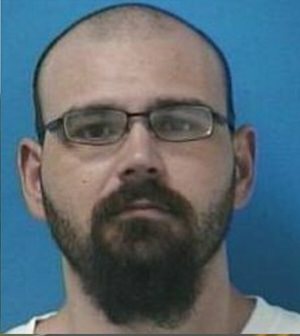 The Tennessee Bureau of Investigation identified the shooting suspect as 31-year-old Steven Wiggins, a convicted felon with a violent criminal history spanning back more than a decade. Authorities have not officially identified the deputy but a close family friend and family on social media have identified him as 32-year-old Sgt. Daniel Baker. KANSAS CITY, Kan. — A Wyandotte County sheriff's deputy is dead and another is in critical condition after they were shot near the county courthouse Friday morning. Officials say that Deputy Patrick Rohrer, 35, was killed in the shooting. He was a seven-year veteran of the Wyandotte County Sheriff's Office. Major Kelli Bailiff with the Wyandotte County Sheriff's Office said at 11:30 a.m. two deputies were transporting inmates to court. They pulled into the parking lot, ready to transport, and they were overcome. Bailiff said it's possible the two deputies were shot with their own guns. The suspect was also shot and taken to the hospital in unknown condition. Sources tell 41 Action News the suspected shooter is Antoine Fielder. 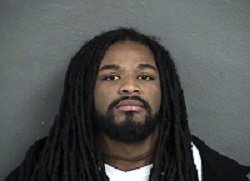 Booking info shows that Fielder has a jury trial for robbery charges coming up on July 30. He’s also been charged with murder, assault and armed criminal action in a December 2017 shooting in Kansas City, Missouri. Fielder has also been charged with two counts of tampering with a witness. Prosecutors alleged that threats to witnesses contributed to two hung juries in a 2015 murder case. An update to the above article. KANSAS CITY, Kan. — Two Wyandotte County sheriff's deputies have died after they were shot near the county courthouse Friday morning. Overnight, KCK Police announced Deputy Theresa King, 44, died from her injuries. She was a 13-year veteran of the department. BOSTON — Police and federal agents are investigating after an explosion started a small fire in an East Boston building overnight. The explosion at 88 Webster Street in East Boston occurred around 12:30 a.m. Sunday. It was so powerful that it blew out the windows of a second-floor apartment where police say a 28-year-old man was mixing chemicals, when the concoction blew up. Police said the fire was put out quickly, but the man was taken from the home with second-degree burn injuries. Police identified him as Tomas Mikula, 28, of Boston. He is facing about half a dozen weapons-related charges, including unlawful possession of explosives. Mikula was taken to Massachusetts General Hospital and kept under police surveillance. He is expected to survive his injuries. "We don't believe there's anything to do with terrorism here," Evans said. "It's just someone who has some weapons in there and is playing around with chemicals and, you know, some powder, and it looks like that blew up on him." Police said they found materials commonly used for making explosives, as well as two handguns, a rifle, and more than a hundred rounds of live ammunition in Mikula's home. As a result, the bomb squad, arson squad and FBI agents are all involved in the investigation. He leaves behind a wife and two small children. WEYMOUTH, Mass. — A police officer and an innocent bystander were shot and killed in Weymouth Sunday morning. Authorities say Weymouth police received a call around 7:30 a.m. about an erratic driver in the area of South Shore Hospital. The driver was involved in a single-car accident and was seen leaving the car on foot. Officers began searching for the suspect when Officer Michael Chesna, 42, located the suspect, identified as Emanuel Lopes, 20, in the area of Burton Terrace vandalizing a home. Authorities say Chesna got out of his cruiser, drew his firearm and told Lopes to stop when Lopes attacked Chesna with a large stone, striking him in the head. Chesna fell to the ground and Lopes took Chesna's gun and opened fire, hitting Chesna several times in his head and chest. Chesna was taken to South Shore Hospital where he was later pronounced dead. Responding officers exchanged gunfire with Lopes, hitting him in one of his legs before Lopes took of on foot through the yards of Burton Terrace. Authorities say officers engaged in a foot pursuit with Lopes when he fired off Chesna's gun three more times, with one of those bullets striking a woman who was in her home and killing her. Lopes was placed into custody after discharging the weapon and taken to South Shore Hospital with non-life-threatening injuries. SEDGWICK COUNTY, Kan. (KSNW) - A Sedgwick County Sheriff's Deputy has died after a shooting in rural Sedgwick County Sunday afternoon. Sedgwick County Sheriff Jeff Easter identified Robert Kunze III as the fallen deputy. The shooting happened shortly before 2:00 p.m. near the intersection of 295th St. W. and 53rd St. N. That's near Garden Plain. Authorities say the suspect who shot deputy Kunze was also killed in the shooting. "Tragedy has struck the Sedgwick County Sheriff's Office, a family member of ours has been killed in the line of duty," said Sheriff Easter. Sheriff Easter said Kunze started his career in law enforcement with the Shawnee County Sheriff's Office, where he served for six years. He began his service with the Sedgwick County Sheriff's Office in 2006, and served the department for 12 years. Upon graduation, Kunze was assigned to second watch where he served several years. He then went to first watch where he was currently assigned at the time of his death. "Robert was always available at a moment's notice," said Easter. "He worked with great pride, loved and encouraged the people who worked with him, but most of all he loved his family." Two accomplices have been arrested. This has been an on-going investigation to catch these thugs. They've been robbing patrons of Latino Bars for months. FORT WORTH (CBSDFW.COM) – A heartbroken community is mourning the loss of a Fort Worth officer who died Friday evening after he was shot by a robbery suspect that morning. 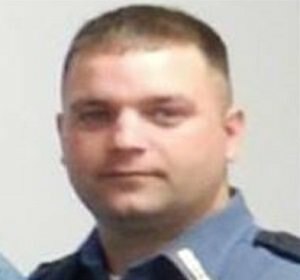 Officer Garrett Hull was shot in the head during a sting operation. The undercover officers tracked suspected robbers to a small bar on Fort Worth’s south side early Friday morning. The officers watched the group of suspects go inside the bar, where witnesses said they robbed as many as 10 people at gunpoint. When the officers moved in to confront them, the suspects opened fire. Hull was struck as shots rang out. Fellow officers loaded Hull into a squad car and rushed him to the hospital where he remained in the ICU through the day. Back at the bar, officers had fired back and fatally shot the suspected gunman, 23-year-old Dacion Steptoe. The 17-year veteran of the Fort Worth Police Department died from his injuries at around 9:40 p.m. Friday, the police chief announced at a midnight press conference. “Police officer Hull is an organ donor and will be able to prolong the life of others… over the next few days… as candidates are matched up with him, we will see him prolong the lives of other folks… because of the sacrifice he made,” Fitzgerald said. Hull leaves behind a wife and two daughters. RANCHO CORDOVA, Calif. (KCRA) — A Sacramento County Sheriff’s Department deputy was shot and killed Monday after responding to a call in Rancho Cordova. The suspect in the shooting has been identified as Anton Lemon Moore, the Sheriff's Department said. Authorities searched his home Tuesday. Deputy Mark Stasyuk, 27, had been with the department for four and a half years, according to Jones. He leaves behind a wife, mother, father and sister, the Sheriff's Department said. Stasyuk and another deputy responded to a call for service around 1:44 p.m. from employees at the Pep Boys auto shop near Folsom Boulevard and McGregor Drive, according to Sheriff's Department spokesman Shaun Hampton. When they arrived, Moore shot at the deputies, the Sheriff's Department. The deputies did not know Moore was armed when they arrived, Jones said. Stasyuk was shot in the upper body, Jones said. The second deputy -- 28-year-old Julie Robertson -- was shot in the arm. She has been released from the hospital, the Sheriff's Department said Tuesday. Stasyuk was a patrol officer contracted out to Rancho Cordova. He had been on the force for four and a half years, the Sheriff's Department said. According to the Sheriff's Department, Stasyuk got married in March. He leaves behind a wife, mother, father and sister, the Sheriff's Department said. The suspect was identified as 20-year-old Raheem Cole Dashanell Davis. He is charged with first-degree murder. Conner pulled over a pickup about midnight on US 701 near Sellers Town Road in Columbus County. When Conner approached the driver's side of the truck, the driver -- later identified as Davis -- opened fire. SWAT officers served a warrant an hour ago at the Maynard residence. They now think a third punk is involved in the shootings. 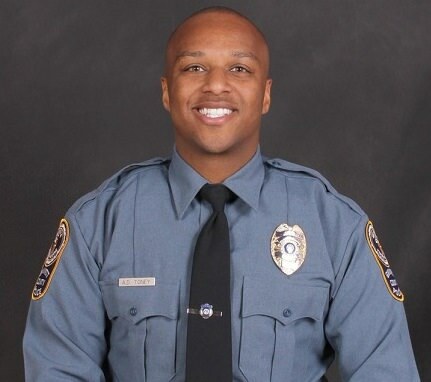 Tafahree Maynard, 18, has been charged with aggravated assault and felony murder in the killing of Gwinnett County officer Antwan Toney on Saturday, the county's police department said. Maynard was still at large late Sunday afternoon. Another officer returned fire and dragged Toney away. He died at a hospital, Sgt. Jake Smith of the Gwinnett County Police Department said. After the shooting, the suspects' four-door black sedan sped away and crashed about a mile away. The suspects fled. Police believe Pretlow was driving the car and that as many as four people were inside.